Oh my goodness! I can't believe that I am living my dream! I have been to 4 countries in less than 3 months. That is what I call real COOL! And my diarrhea didn't stop when I left for China. It bothered me for the whole duration of the camp. Man, it was real bad. But of course, it didn't stop me from enjoying myself there. I focused on the good things! Beijing is place of rich culture and tradition. It is also a place that you have to be extra careful while traveling. Watch out for Taxis that don't charge by the meter! You have to negotiate a price first before you hop on. And you have to really bargain. Otherwise, you'll spend a lot more on transport than you need to. Or, you can always choose the Subway (like the MRT in Spore). It is convenient, cheap and it will bypass all the traffic jams on the road! (And trust me, there are an awful lot of traff ic jams in the city!) For Taxis that charge by the meter, it is relatively cheap. When people talk about Beijing, there are a few places that immediately springs to mind. 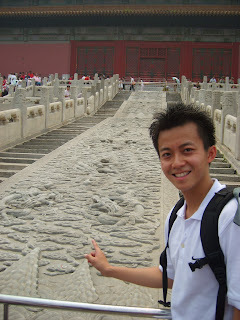 One of the famous attractions is none other than the Forbidden City. It was the place where Emperors rule the country. 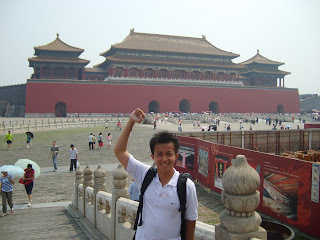 Before you enter Forbidden City, you have to pass by the infamous Tian an men Square. Tian an men Square is huge. But I feel that its beauty is overshadowed by the bloodshed of thousands of people during the protest in 1989. I was kind of disappointed with the trip the Forbidden City because of the restoration works going on in preparation for the 2008 Olympic Games. I don't blame anybody for that. I count myself blessed to even have the chance to go there. The place is majestic, even with metal structures and construction nets all around. I can only imagine its full grandeur and splendor in its glory days. 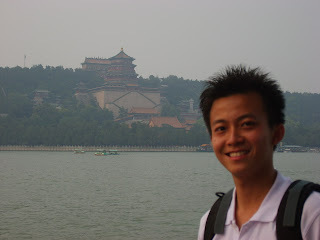 I also went to Yi He Yuan or Summer Palace. This place is built for the Emperor to visit during Summer time escape from the heat. Summer Palace has probably the biggest man-made lake ever created. It took me 10 mins on a boat to get from one place to another. And it is not even near the other end of the lake! I like this place a lot. Mainly because of its romantic ambiance and relaxing feel. Definitely an ideal dating site for couples. There is another place worth visiting in Beijing. 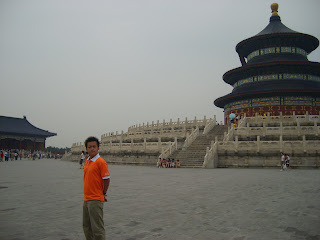 It is called "Temple of Heaven". This was where the Emperor used to pray. I believe that you will find this place familiar if you watch Chinese Drama Serials. Of course, if anyone ever goes to Beijing, the next place is a definite-must-go. It is voted and declared as one of the New 7 Wonders of the world. If you do not know, there are New 7 Wonders of the world that were declared on 07/07/07. They chose them based on votes from around the world. The sad thing was that Angkor Wat is not one of the 7!!! But then, it is still a 7 Wonder finalist. To me, Angkor Wat is definitely a Wonder of the World. Can you believe that the 7 Wonder thing is now becoming a popularity contest? Anyway, where was I? Oh, a definite-must-go in Beijing. By now you should have guessed that it is none other than the Great Wall of China. It stretches over 6400 km and is the only man-made structure that can be viewed from out er-space. Do I need to say more? The climb up the Great Wall was tiring. Real tiring. Can you imagine that the whole stretch of Wall was built on mountain ranges? It is just unbelievable! The view from the top is awe-inspiring. I could see the Wall meander along the mountain ranges and then disappears from my view. I think "Wow" can basically describe the place. Food in Beijing is relatively cheap. I can get a Bun for 10 cents. The noodles there are good too! And when you are in Beijing, you wouldn't want to miss out on the Peking Roast Duck. Damn delicious! I went to Quan Ju De Roast Duck Restaurant and waited for 30 mins in the queue! It is the most famous Peking Duck restaurant in that area. They even give out certificates to certify people that they have been there to eat. Cool right? This trip to Chin a was a enjoyable one for me--even though I had to endure 1 week of diarrhea! I got to experience their culture and learned to appreciate their tradition. It is a place worth visiting. Of course, please choose to visit only after the 2008 Olympics. By then, I believe it will be more tourist-friendly. 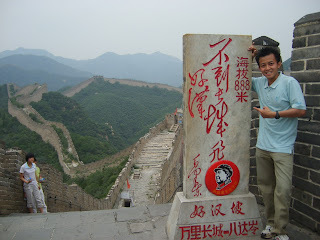 Mao Zedong had a saying, "You are not a real man if you haven't climbed the Great Wall." So I guess now I am real man. Haha! 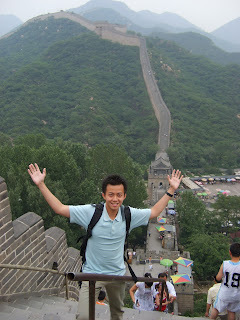 Go climb the Great Wall and your LIFE WILL NEVER, EEEE....EE...EVER, BE THE SAME AGAIN! www.peter-lau.com is very informative. The article is very professionally written. 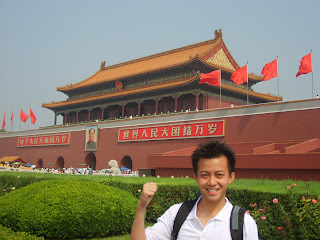 I enjoy reading www.peter-lau.com every day.